cairnswk wrote: perhaps it's the country i.e. not USA. Oneyed wrote: hm, airport gameplay looks fine now. but could you a little play with airports deployment? or they are done by reality? each region (continent) have one or none airport, except Cantenbury and Otago. they have two airports. Cantenbury is the largest region so two airports here are fine. by I can not see any reason why Otago could has two airports (and neither why two whitesones). what about to take white airport from Queenstown to west coast? maybe add it to Milford Sound (Southland is the second largest region, so would has also two airports). 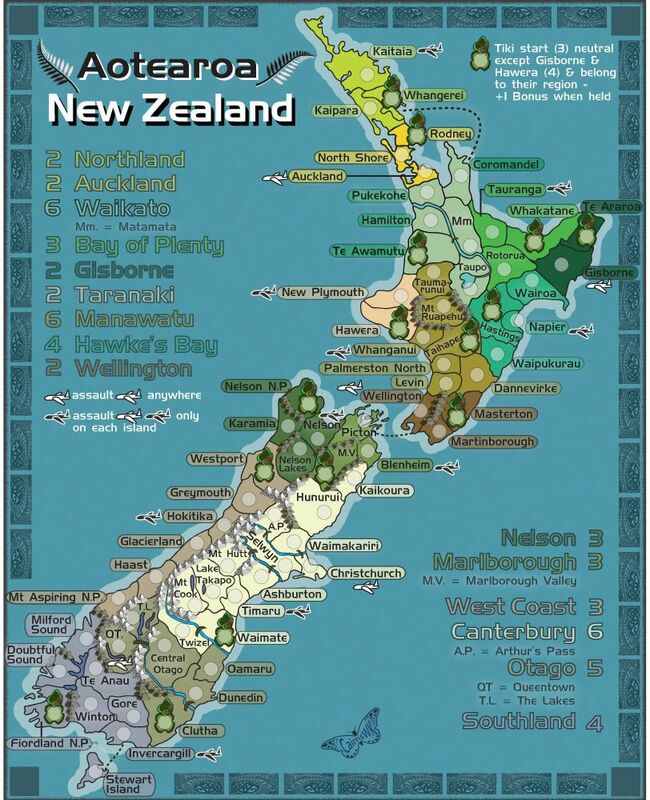 the north island has 33 regions and 5 black airports, the south island has 39 regions and 4 black airports. maybe add one black airport to Karamia? I can remove the white airport from Dunedin for Otago, but definitely not Queenstown, and west coast can only have black plane. And Milford is also out of the question since it is surrounded by very steep mountains. I can ads a black plane to Nelson, but not Karamia. I like it and cant see any problems. just what about this? Could you, maybe, try having an objective to also win the game? Spice up the game play a little. Everything else looks good. Nola_Lifer wrote: Could you, maybe, try having an objective to also win the game? Spice up the game play a little. Everything else looks good. Nola_Lifer, thanks for your suggestion...but i'd prefer to keep this one simple gameplay. I think the tikis and the planes would be enough. I agree with you -- an objective would be gilding the lily. Re: New Zealand [29.1.12] V9 P6 - Gameplay Stamp perhaps? 1. Plane sorted on Nelson. 2. changes to the border - i wanted to create that famous NZ tattoo look for the border...so i incorporated the silver fern and the existing border into my own design - subtle and the corners are yet to be done. I'm not particularly fond of the borders you've had so far, but I don't have any better suggestions so I'll just remain mostly indifferent since it is a non-gameplay or gameplay-graphic issue, though I will mention that I think any border can probably be made softer or more transparent, so it looks less like a hard border. AndyDufresne wrote: I'm not particularly fond of the borders you've had so far, but I don't have any better suggestions so I'll just remain mostly indifferent since it is a non-gameplay or gameplay-graphic issue, though I will mention that I think any border can probably be made softer or more transparent, so it looks less like a hard border. First time I saw it I didn't like it. Looked at it the next day and though it was a good addition. I like it! You haven't added impassables to the legend yet though, I assume mountains and rivers are impassable but it needs to be squeezed in somewhere. Don't think I've ever seen a map with as many mountains as this one, gives it a nice look if you ask me! Gillipig wrote: I like it! You haven't added impassables to the legend yet though, I assume mountains and rivers are impassable but it needs to be squeezed in somewhere. Don't think I've ever seen a map with as many mountains as this one, gives it a nice look if you ask me! OK, i can add the impassables bit if you think it is necessary. Too late, already added in next version. koontz1973 wrote: Frodo or impassable legend? For now, Version 10 with starting neutrals, and impassables notated - on front page also. Victor Sullivan wrote: I wonder if perhaps Wellington and Taranaki would do better as +1s? Even with ian's hike in neutral size, both bonuses would still be desirable. +1 is certainly possible, since it becomes +2 with the tiki. we'll have to change them back if it's clear during beta that no-one's interested in these bonuses. ian, i have to ask that if we change the +2s on wellington and taranaki to +1, why not do that for the other territories with +2 bonuses - namely Auckland and Northland and Gisborne? Ah, I missed Gisborne. I would say yes to that. For Auckland and Northland, it can go either way. I think it may be best to reduce Auckland to +1, but leave Northland at +2. I think that strikes a nice balance between the pros and cons of raising and lowering their bonuses, though like I said, it can go either way. for some reason, i thought that u meant gisborne when u said wellington. while i still believe taranaki is worth only a +1 (all zone bonuses mentioned in this post exclude the tiki bonus), this does not apply for any bonus zone, such as gisborne, that includes a white plane because it must cope with one-way assaults. none of us had taken this important factor into sufficient account previously in discussing bonuses. my recommendations are as below. ian, excellent analysis. i'll make the changes to the map today and post new version. iancanton wrote: auckland: raise from +2 to +3 because of the one-way assaults. These are the only gameplay changes from Ian's excellent list that I'd think more about. In regards to Southland, even if it is in a corner, it seems hard for me to say it is equally valuable as Auckland and Wellington, it seems worth more. In regards to Auckland and Wellington, +3 seems to be pushing it. I agree with ian about Wellington and Auckland, both are white planes, with them being able to be assaulted from 5 other terrs. Before i go further, and i appologise to any who has already suggested it, does anyone want to split Canterbury...re-exmaing the regions now it is simply too large. AndyDufresne wrote: In regards to Southland, even if it is in a corner, it seems hard for me to say it is equally valuable as Auckland and Wellington, it seems worth more. cairnswk wrote: Before i go further, and i appologise to any who has already suggested it, does anyone want to split Canterbury...re-exmaing the regions now it is simply too large.